A classic text since it was first published in 1974, the Lippincott Manual for Nursing Practice (LMNP) has provided essential nursing knowledge and up-to-date information on patient care for nearly 40 years. Now in its 10th edition, this full-color text continues to serve as the most comprehensive reference for practicing nurses and nursing students worldwide. 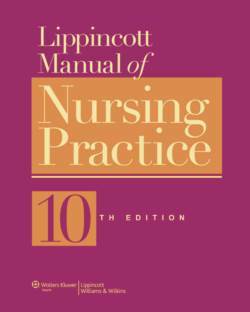 Often referred as the 'Lippincott Manual' or simply the 'Lippincott', the LMNP is widely used as a procedure manual for many healthcare institutions (contains 157 Nursing Procedure Guidelines). It is also widely regarded as the Gold Standard for nursing practice in the classroom. Organized into five major parts, LMNP presents a comprehensive reference for all types of core nursing care. Part 1: Nursing Process & Practice; Part 2: Medical-Surgical Nursing; Part 3: Maternity & Neonatal Nursing: Part 4: Pediatric Nursing; Part 5: Psychiatric Nursing. Content is evidence-based with supporting articles highlighted in actual entries and procedure guidelines. Official Guidelines that shape practice are incorporated in to the content and include those from the National Institutes of Health, American Diabetes Association, American Heart Association, American Nurses Association, Joint Commission, AWHONN, and others. A companion Website includes full text, an image bank, and drug-related NCLEX®-style questions, FDA updates, and new clinical studies.